IRELAND’S BID TO win a seat on the UN Security Council had a high-profile beginning last night, as UN ambassadors attended a U2 concert alongside the Taoiseach and Tánaiste. Leo Varadkar and Simon Coveney have travelled to New York to kickstart the bid for the spot on the council for 2021-2022, where Ireland faces competition from Norway and Canada for the solitary seat. The formal launch event takes place today but, last night, Bono gave a shoutout to the UN ambassadors after the band provided the Irish government with a number of gift tickets to the gig in Madison Square Garden. “If the United Nations didn’t exist, we’d have to invent it and that’s the truth. It’s the one place that puts peace on the negotiating table first,” he said, while also singling out the Taoiseach, Tánaiste and former president Mary Robinson who are all playing a role in Ireland’s bid. Ireland has previously held a non-permanent spot on the security council on three occasions, most recently in 2001-2002. In a statement to TheJournal.ie, the Department of Foreign Affairs said: “Such formal launches are very much part of Security Council election campaigns and something which is expected of candidates. It is standard practice to invite representatives from all 192 other member states to events of national significance at the UN. The event on 2 July is being organised by Ireland’s Permanent Mission to the UN in New York, with support from DFAT in Dublin. It is anticipated that 400 guests will attend. Today’s launch event at the UN headquarters in New York will include elements showcasing “Irish music and dance, as well as our food and drink”. The actual vote will not take place until 2020. Coveney added: “We are looking to serve on the UN Security Council over 2021-22 because we believe in a strong UN and we want to be at the centre of it, advocating for our core values. We have unique perspectives to bring based on our experiences in areas like peacekeeping, conflict resolution and international development. 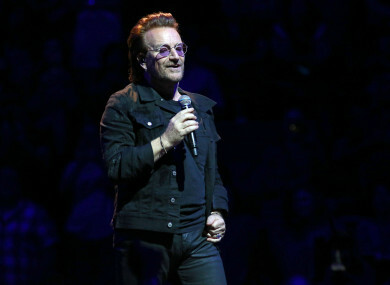 Email “Bono gives shoutout to Irish security council bid during Madison Square Garden concert”. Feedback on “Bono gives shoutout to Irish security council bid during Madison Square Garden concert”.